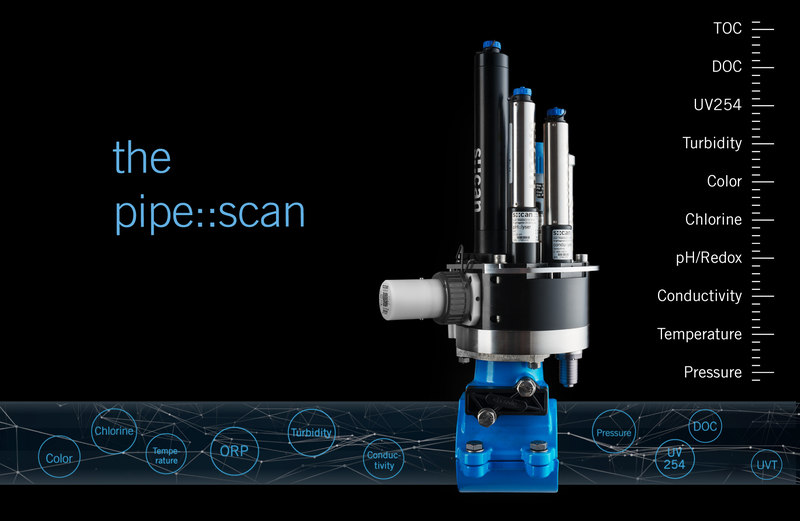 The pipe::scan is a multiple sensor system for monitoring drinking water quality in pipes under pressure. Completely modular and configurable, it measures up to 10 key parameters in one device: TOC, DOC, UV254, Turbidity, Color, Chlorine, pH/Redox, Conductivity, Temperature and Pressure. The real-time data can be transmitted to any central database via almost any communication protocol using the revolutionary terminal con::cube. Therefore multiple pipe::scans are the ideal solution to monitor drinking water at any point in the distribution network. Some of the unique benefits of the pipe::scan include its accurate measurement in perfect agreement to standardized lab reference, organics and turbidity monitoring, and full-scale event detection with real-time alarms within the drinking water distribution network. Maintenance can be done without interrupting the flow/ pressure and for each sensor individually. The 6 months service interval time enables an efficient, reliable stand-alone operation without maintenance. s::can Messtechnik GmbH was founded in 1999 and is based in Vienna/Austria. With sales offices in 6 countries and sales partners around the world, s::can measuring systems are available in 45 coun­tries. Today, with close to 10.000 systems sold, s::can is the global leader in online optical water moni­toring systems.